Six of Studio Ghibli's films are among the 10 highest-grossing anime films made in Japan, with Spirited Away (2001) being the highest, grossing over US$290 million worldwide. Many of their works have won the Animage Anime Grand Prix award, and four have won the Japan Academy Prize for Animation of the Year. Five of Studio Ghibli's films have received Academy Award nominations. Spirited Away won the Golden Bear in 2002 and the Academy Award for Best Animated Feature Film in 2003. Totoro, a character from My Neighbor Totoro, is the studio's mascot. On 3 August 2014, Studio Ghibli temporarily halted production following the retirement of director Hayao Miyazaki, who co-founded the studio with the late Isao Takahata. 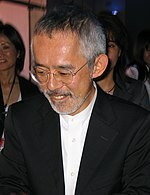 In February 2017, Toshio Suzuki announced that Miyazaki had come out of retirement again to direct a new feature film, How Do You Live?, with Studio Ghibli. The name Ghibli was given by Hayao Miyazaki from the Italian noun ghibli, based on the Libyan-Arabic name for the hot desert wind of that country, the idea being the studio would "blow a new wind through the anime industry". It also refers to an Italian aircraft, the Caproni Ca.309 Ghibli. Although the Italian word is more accurately transliterated as ギブリ (Giburi), the Japanese name of the studio is ジブリ (Jiburi). Three of the four founders of Studio Ghibli. From top to bottom: Hayao Miyazaki, Isao Takahata, Toshio Suzuki. Founded on June 15, 1985, the studio is headed by the directors Hayao Miyazaki and Isao Takahata and the producer Toshio Suzuki. Prior to the formation of the studio, Miyazaki and Takahata had already had long careers in Japanese film and television animation and had worked together on Hols: Prince of the Sun and Panda! Go, Panda! ; and Suzuki was an editor at Tokuma Shoten's Animage manga magazine. The studio was founded after the success of the 1984 film Nausicaä of the Valley of the Wind, written and directed by Miyazaki for Topcraft and distributed by Toei Company. The origins of the film lie in the first two volumes of a serialized manga written by Miyazaki for publication in Animage as a way of generating interest in an anime version. Suzuki was part of the production team on the film and founded Studio Ghibli with Miyazaki, who also invited Takahata to join the new studio. 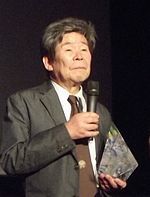 The studio has mainly produced films by Miyazaki, with the second most prolific director being Takahata (most notably with Grave of the Fireflies). Other directors who have worked with Studio Ghibli include Yoshifumi Kondo, Hiroyuki Morita, Gorō Miyazaki, and Hiromasa Yonebayashi. Composer Joe Hisaishi has provided the soundtracks for most of Miyazaki's Studio Ghibli films. In their book Anime Classics Zettai!, Brian Camp and Julie Davis made note of Michiyo Yasuda as "a mainstay of Studio Ghibli’s extraordinary design and production team". At one time the studio was based in Kichijōji, Musashino, Tokyo. In August 1996, Disney and Tokuma Shoten formed a partnership in which Buena Vista Pictures would be the sole international distributor for Tokuma Shoten's Studio Ghibli animated films. Since then, all three afore-mentioned films by Miyazaki at Studio Ghibli that were previously dubbed by Streamline Pictures have been re-dubbed by Disney. On June 1, 1997, Tokuma Shoten Publishing consolidated its media operations by merging Studio Ghibli, Tokuma Shoten Intermedia software and Tokuma International under one location. Many of Ghibli's films in Japan are theatrically distributed by Toho while home video releases are handled by Walt Disney Studios Home Entertainment Japan. Wild Bunch holds the international sales rights to many of Ghibli's films. Ghibli's main international distribution partners also include Disney (Japan Home Video, Taiwan, France), GKIDS (North America), StudioCanal (United Kingdom and Ireland), and Madman Entertainment (Australia). Germany-based Wild Bunch itself handles international sales for Studio Ghibli's works. Over the years, there has been a close relationship between Studio Ghibli and the magazine Animage, which regularly runs exclusive articles on the studio and its members in a section titled "Ghibli Notes." Artwork from Ghibli's films and other works are frequently featured on the cover of the magazine. Saeko Himuro's novel Umi ga Kikoeru was serialised in the magazine and subsequently adapted into Ocean Waves (film), Studio Ghibli's only animated feature length film created for television and it was directed by Tomomi Mochizuki. Between 1999 and 2005, Studio Ghibli was a subsidiary brand of Tokuma Shoten, however, that partnership ended on April 2005 when Studio Ghibli was spun off from Tokuma Shoten, and was re-established as an independent company with relocated headquarters. On February 1, 2008, Toshio Suzuki stepped down from the position of Studio Ghibli president, which he had held since 2005, and Koji Hoshino (former president of Walt Disney Japan) took over. Suzuki said he wanted to improve films with his own hands as a producer, rather than demanding this from his employees. Suzuki decided to hand over the presidency to Hoshino because Hoshino has helped Studio Ghibli to sell its videos since 1996 and has also aided the release of the Princess Mononoke film in the United States. Suzuki still serves on the company's board of directors. Takahata developed a project for release after Gorō Miyazaki's (director of Tales from Earthsea and Hayao's son) The Tale of the Princess Kaguya – an adaptation of The Tale of the Bamboo Cutter. The last film Hayao Miyazaki directed before retiring from feature films was The Wind Rises which is about the Mitsubishi A6M Zero and its founder. On Sunday, September 1, 2013, Hayao Miyazaki held a press conference in Venice to confirm his retirement, saying: "I know I've said I would retire many times in the past. Many of you must think, 'Once again.' But this time I am quite serious." On January 31, 2014, it was announced that Gorō Miyazaki will direct his first anime television series, Sanzoku no Musume Rōnya, an adaptation of Astrid Lindgren's Ronia the Robber's Daughter for NHK. The series is computer-animated, produced by Polygon Pictures, and co-produced by Studio Ghibli. In March 2014, Toshio Suzuki retired as producer and assumed the new position of general manager. Yoshiaki Nishimura replaced Suzuki in the producer role. On August 3, 2014, Toshio Suzuki announced that Studio Ghibli would take a "brief pause" to re-evaluate and restructure in the wake of Miyazaki's retirement. He stated some concerns about where the company would go in the future. This has led to speculation that Studio Ghibli will never produce another feature film again. On November 7, 2014, Miyazaki stated, "That was not my intention, though. All I did was announce that I would be retiring and not making any more features." Lead producer Yoshiaki Nishimura among several other staffers from Ghibli, such as director Hiromasa Yonebayashi, left to found Studio Ponoc in April 2015, working on the film Mary and the Witch's Flower. The 2016 animated fantasy film The Red Turtle, directed and co-written by Dutch-British animator Michaël Dudok de Wit in his feature film debut, was a co-production between Studio Ghibli and Wild Bunch. 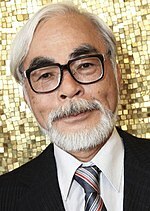 In February 2017, Toshio Suzuki announced that Hayao Miyazaki has come out of retirement to direct a new feature film with Studio Ghibli. On November 28, 2017, Koji Hoshino stepped down as President; he was replaced by Kiyofumi Nakajima (former Ghibli Museum director). Hoshino was then appointed as Chairman of Studio Ghibli. While Nausicaä of the Valley of the Wind is often considered a Studio Ghibli film, it was produced and released before the studio's official founding. ^ 会社情報 Archived July 18, 2011, at the Wayback Machine." Studio Ghibli. Retrieved on 26 February 2010. ^ John (November 22, 2011). "Everything You Need to Know About Studio Ghibli". Tofugu. Archived from the original on May 8, 2018. Retrieved May 3, 2018. ^ Camp, Brian; Davis, Julie (September 15, 2007). Anime Classics Zettai. Berkeley California: Stone Bridge Press. p. 292. ISBN 978-1-933330-22-8. Archived from the original on February 22, 2014. Retrieved February 14, 2014. ^ "August Issue News Section:Disney Will Distribute Japanese Animation". Animation World Magazine. August 1996. Archived from the original on September 29, 2013. Retrieved July 19, 2011. ^ Karrfalt, Wayne (May 27, 1997). "Tokuma looks to merge film, media distribution". The Hollywood Reporter. Archived from the original on March 5, 2016. Retrieved May 21, 2015. ^ a b "The Disney-Tokuma Deal". nausicaa.net. September 10, 2003. Archived from the original on December 29, 2010. Retrieved August 8, 2014. ^ a b Hopewell, John; Keslassy, Elsa (August 19, 2013). "Wild Bunch, Miyazaki Re-Team on The Wind Rises". Variety.com. Variety. Archived from the original on February 8, 2018. Retrieved August 8, 2014. ^ "GKids to distribute 13 Ghibli anime films in US". Animenewsnetwork.com. September 7, 2011. Archived from the original on January 5, 2012. Retrieved June 10, 2014. ^ Toyama, Ryoko. "Umi ga Kikoeru: Frequently Asked Questions". Nausicaa.net. Archived from the original on August 20, 2017. Retrieved August 12, 2017. ^ "Japan, 18-28 April 2003". fjordaan.net. Archived from the original on December 1, 2014. Retrieved April 17, 2015. ^ スタジオジブリ社長に星野康二氏 (in Japanese). Archived from the original on February 2, 2008. Retrieved February 1, 2008. ^ "Miyazaki shorts come to Carnegie Hall for one day only". Asia Pacific Arts. March 4, 2011. Archived from the original on August 8, 2014. Retrieved March 9, 2011. ^ Ashcraft, Brian (July 23, 2012). "Studio Ghibli's Next Film is about Japan's Most Famous Fighter Plane (and the Guy who Designed It)". Kotaku. Archived from the original on October 2, 2012. Retrieved September 30, 2012. ^ Highfill, Samantha. (2013-09-06) Hayao Miyazaki on his retirement: 'This time I am quite serious' | Inside Movies | EW.com Archived October 21, 2013, at the Wayback Machine. Insidemovies.ew.com. Retrieved on 2014-05-12. ^ "Goro Miyazaki to Direct Ronia the Robber's Daughter TV Anime". Anime News Network. January 30, 2014. Archived from the original on February 9, 2014. Retrieved February 14, 2014. ^ "Polygon Pictures to Create Animation Under Goro Miyazaki's Direction, The Animated TV Series Ronia, the Robber's Daughter, Premiering on NHK BS in Autumn 2014". Polygon Pictures. January 31, 2014. Archived from the original on February 23, 2014. Retrieved February 14, 2014. ^ "Ghibli Co-Founder Toshio Suzuki Retires as Producer". Anime News Network. March 9, 2014. Archived from the original on March 9, 2014. Retrieved March 9, 2014. ^ "Toshio Suzuki スタジオジブリを背負った男。ヒットメーカー・鈴木敏夫のプロデューサー哲学に迫る". MBS. August 3, 2014. Archived from the original on August 6, 2014. Retrieved August 3, 2014. ^ Schilling, Mark (August 3, 2014). "Japan's Studio Ghibli Envisages Short Break, not Imminent Closure". Variety. Penske Business Media, LLC. Archived from the original on August 18, 2017. Retrieved August 4, 2014. ^ "Spirited Away maker Studio Ghibli halts production". BBC News. August 4, 2014. Archived from the original on April 17, 2015. Retrieved February 8, 2015. ^ Vincent, Alice (August 4, 2014). "Studio Ghibli may stop making films". The Telegraph. Archived from the original on August 3, 2014. Retrieved February 8, 2014. ^ "Hayao Miyazaki isn't making features but is at work on a manga". LA Times. November 7, 2014. Archived from the original on November 13, 2014. Retrieved November 7, 2014. ^ "Ghibli Producer Suzuki: Hayao Miyazaki is Preparing to Work on New Feature Film". Anime News Network. February 24, 2017. Archived from the original on March 1, 2017. Retrieved March 1, 2017. ^ "Studio Ghibli Appoints Kiyofumi Nakajima as New President". Anime News Network. November 28, 2017. Archived from the original on December 1, 2017. Retrieved December 1, 2017. ^ "Hotaru no haka (Grave of the Fireflies) (1988)". Rotten Tomatoes. Fandango Media. Archived from the original on May 25, 2016. Retrieved July 5, 2016. ^ "My neighbor Totoro (1988)". Rotten Tomatoes. Flixster. Archived from the original on August 17, 2015. Retrieved December 27, 2015. ^ "Kiki's delivery service (1989)". Rotten Tomatoes. Flixster. Archived from the original on August 20, 2015. Retrieved December 27, 2015. ^ "Porco Rosso (Kurenai no buta) (1992)". Rotten Tomatoes. Flixster. Archived from the original on August 17, 2015. Retrieved December 27, 2015. ^ "Pom Poko (Heisei tanuki gassen pompoko) (The Raccoon War) (1994)". Rotten Tomatoes. Flixster. Archived from the original on August 20, 2015. Retrieved December 27, 2015. ^ "My Neighbors the Yamadas (1999)". Rotten Tomatoes. Flixster. Archived from the original on August 20, 2015. Retrieved December 27, 2015. ^ "Spirited Away (2001)". Rotten Tomatoes. Flixster. Archived from the original on June 19, 2015. Retrieved December 27, 2015. ^ "The Cat Returns (2002)". Rotten Tomatoes. Flixster. Archived from the original on June 24, 2015. Retrieved December 27, 2015. ^ a b "Studio Ghibli to release Miyazaki, Takahata films in Summer 2013". The Asahi Shimbun. December 21, 2012. Archived from the original on January 1, 2013. Retrieved January 3, 2013. ^ "Ghibli Adapts Joan G. Robinson's When Marnie Was There Novel Into Anime". Anime News Network. December 12, 2013. Archived from the original on December 13, 2013. Retrieved May 12, 2014. ^ "Studio Ghibli is getting ready for Hayao Miyazaki's next (and probably last) film". The A.V. Club. Archived from the original on February 13, 2018. Retrieved February 13, 2018. ^ "Details Revealed on Hayao Miyazaki's New Anime Film How Do You Live?". Archived from the original on February 13, 2018. Retrieved February 13, 2018. ^ "Ghibli's Hayao Miyazaki Reveals His 'Final' Film's Title, Release Window". Anime News Network. October 28, 2017. Archived from the original on February 24, 2018. Retrieved June 10, 2018. Wikimedia Commons has media related to Studio Ghibli.